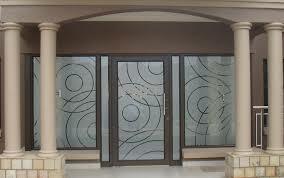 Sandblasting Vinyl is also known as sandblast or frosted vinyl. This Vinyl is very popular lately as it is an effective and affordable way to brand your windows, either at home, in shopping centers or in offices. Sandblasting vinyl is very divers and there are many ways in which it can be used. You could either add patterns, wording, logos or solid panels to your windows. We also have the option of printed sandblasting vinyl. This is very popular when you want to add colour to a large window that you want blocked out entirely. The options are really only limited by one’s imagination. The surface area to be covered (size of glass panel/s). The detail in your design/logo. For the application the height from the ground and the location of the site are important. The finer (more detailed) the cut-out detail is, the more we charge per square meter for the vinyl. this is due to the fact that if there is a lot of detail it takes longer to plot (cut-out) the vinyl and then also to weed it. Weeding is the term used to remove the excess vinyl after plotting. Please supply us with the information above via email to request a quotation.